Silberra MG Developer is a concentrated single-solution (one-shot) phenidone-hydroquinone concentrated developer for photo papers. It works fine with all types of photo papers, gives normal contrast, it is economical and easy to use, and, what's more, the concentrate has high usage limit and can be stored for a long time. Dilute the concentrate of Silberra MG with distilled water of about 20-22 Celsium degrees to a ratio 1:9. It is recommended to stir the concentrate before diluting. If precipitate appears it is necessary to filter the working solution before use; precipitate does not affect chemical properties of the developer. Average development time for photo papers at SIlberra MG Developer stock dilution is 2 minutes at 20C. Silberra MG working solution's effective usage limit for photo papers is 1,2 sq.m. per 1 litre (approximately 30 sheets of 18х24 cm). Storage of concentrated developer at low temperatures may cause crystalline precipitate; the precipitate dissolves after heating and stirring the concentrate. If you see dark tint and flocculent suspension in the concentrate, its storage period is coming to an end, and we recommend to test this developer on a photo paper fragment before use. 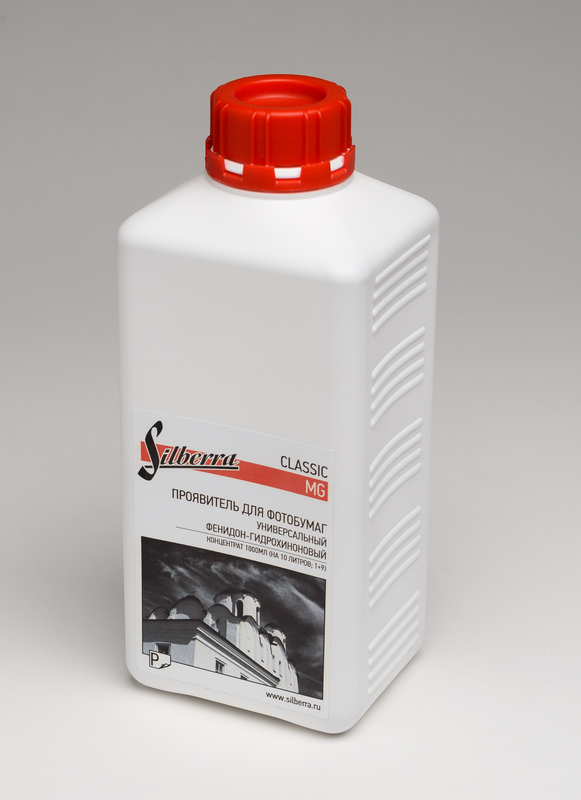 Keep Silberra MG Developer in a cool, dry and dark place. Keep away from children. All the solutions should be stored in tightly sealed bottles with low internal air volume. Concentrated Silberra MG Developer may be stored in its original sealed bottle for up to 6 months; the working solution can be stored in a tapped vessel for 25 days past production date. Reuse and storage of the used solution is not recommended.